The Business of Real Estate is fraught with lots of emotions, and on all sides; Sellers, Buyers, Agents, Brokers, and throw in the vendors in the industry. The Business brings out the best in many, as well as lots of tears and anger in many others; it is also a business that requires an understanding that negotiations and compromise are the key to making deals work; but one must also understand that Sellers want to Sell as high as possible and only see the home they are offering and think of it as ‘absolutely’ unique; Buyers wish to pay the least possible and at times over-negotiate and place deals in jeopardy; and let’s not forget some agents take each deal personally, way too personally, and at times become combative with other agents and clients. You throw in this many people into a deal and conflict will arise. 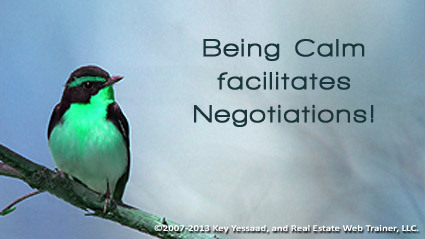 You the agent cannot fix or alter the feelings of any participant to a transaction, but you can stay Calm, collected, and remind people of what is most important to them; the more grounded you are, and view the transaction from a higher plain, the easier it will be to let people calm down and see what is in their best interest.